Our collection of Samsung Blu-ray and DVD players features an array of models to suit a broad spectrum of needs and budgets whether you’re ready to go all in on cutting-edge Blu-ray technology, or don’t fancy abandoning your favourite DVDs just yet. 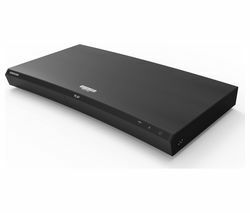 If you’re looking for Samsung Blu-ray players that can also handle DVDs, the BD-J4500 Blu-ray & DVD Player is a great, no-frills option that plays both formats – great news if you value your DVD collection. The BD-J4500 will even upscale DVDs to Full HD allowing you to experience rich, sharp visuals and clear sound like never before. Your old DVDs have never had it so good! In addition to DVD and Blu-ray functionality, this brilliantly affordable multi-tasker also lets you play your own multimedia from a USB memory stick or HDD. AllShare lets you access movies, music and photos via DLNA, so you can enjoy your content wirelessly. If immersive, crystal-clear visuals are a priority then look no further than the remarkable UBD-K8500/XU Smart 4k Ultra HD 3D Blu-ray Player. This cutting-edge player delivers stunning 4K performance that makes it an asset to any home cinema setup. Designed to showcase films the way the director intended, the UBD-K8500 reproduces brightness and colour the way it's mastered in film studios, granting you a rare and exhilarating cinematic experience in your own living room. Check out our full range of Blu-ray and DVD players to compare the latest models from all the leading brands. Looking for a TV to make the most of your Blu-ray and DVD player? Alongside our extensive choice of Samsung DVD players our range of TVs includes a great choice of sets to suit all budgets.